For those of you who have followed me through the change of seasons, you may remember that I don’t totally love summer, despite its gardening wonders, bountiful fruit and golden lining. But autumn? Quite simply … I love it. A favorite tree at one of my favorite spots in the whole world. All of summer’s lovely flowers can’t come close to the stirring of my soul when I look on this tree in fall. It’s as if I’ve held my breath to survive the heat and humidity and mosquitoes of summer and, when I see the promise of this tree, I can finally let the breath go. 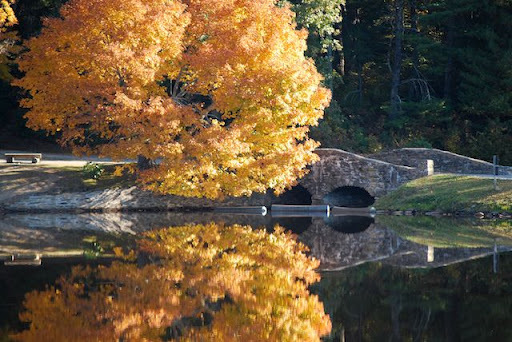 I can’t wait to visit it again soon and see whether this fall will repeat this beautiful image — the brilliant orange blazing in the sunlight and the calm water reflecting its fire. I was digging through my photo files looking for this particular one to share with you, when I thought back to a photography class/walk I took at Yosemite this past spring. The instructor spoke of how important light is for taking quality photographs. Seems like a “well, duh” piece of advice, but think of what kinds of photographs we would have without the light. I have a photo of this same tree taken the day before this one. It was a cloudier, windy day, and the leaves in that other photo look dull, and the water too stirred up to reflect the tree well. It’s just a ho-hum photo. The light is what makes the difference. Autumn brings with it cool crisp days and clearer sunlight that doesn’t have to struggle through the humid haze of summer, and I think that’s why I love this season the most. There’s a sudden ‘blazing in’ of autumn, a moment when you’re driving along a road you travel daily and are suddenly struck by the beautiful display of color. But as with any season, autumn does have its drawbacks, and its biggest has to do with light. Or lack thereof. What I love most about summer is what I love least about autumn — the amount of daylight we get to enjoy. The daylight hours grow shorter, and fall’s time change ushers in a rude surprise of early darkness. But the cooler weather encourages me to get outside more during the day and soak in the light every chance I get. So even though I know shorter days are ahead, I revel in autumn’s light. “Then Jesus again spoke to them, saying, ‘I am the Light of the world; he who follows Me will not walk in the darkness, but will have the Light of life'” (John 8:12). Isn’t that a wonderful message? If we follow Him, we have no need to fear the approaching dark because His light will shine in us and around us and through us. So while it’s the sunlight that makes for better photographs and more enjoyable outdoor adventures, it’s the Son’s light that truly makes a difference. I hope that, whether you love fall or approach it with loathing, the idea of soaking in the sunlight and the Son’s light will carry you through the season. And if you have a friend who needs encouragement as fall approaches, who may need a reminder that no ray of sunshine is ever lost, then I invite you to forward this message on. Carry your light out into the world as a testimony to the power of the Light in your life. This entry was posted in flourishing tree and tagged Autumn, light, trees by hopesquires. Bookmark the permalink. Hi, Tracey — thanks for your response. I'll see if I can dig up a few photos of that tree in different light and post them tomorrow before I write my regular weekly entry.I took the photo at Bass Lake in Blowing Rock, NC. It's part of the Moses Cone National Park property, and it's heavenly in the fall. Not so fun in the deep winter, though, when the lake is completely frozen and the wind whips over the dam. And yet, even then, it brings me joy and peace. This photo is gorgeous. Where was it taken? Brilliant insight about the light. I think it would be interesting to see the same scene in different lighting. Can you post your day-before photo? JAK — Thanks for describing the different falls you have experienced! What a wonderful collection of memories you have gathered. Thanks for sharing a snapshot of them with us. It sounds like this fall will be a wonderful time away in NC for you. Enjoy!